The smarter way to keep tabs on your pet's location and activity levels while they're living it up, at home, in the park or on the run. Now part of the MARS family, Whistle is a mission driven company dedicated to building technology that brings pet owners and their pets closer together. The Whistle devices use GPS and cellular technology to locate and track pets. Whistle also tells users how much activity and rest their pet is getting and tracks progress with customized goals. The following is a compilation of design projects that I led and produced for Whistle's 3 respective hardware products. While at Whistle, I have conducted over 100 user interviews and countless usability testing sessions to understand what users care about. The research approach is a combination of quantitative and qualitative, drawing from data whenever needed but placing a big emphasis on the feedback and stories of Whistle users. I have spent a lot of time analyzing pet and pet owner relationships as well as pet owner behavioral patterns and motivations. I launched and utilized Whistle's beta program to gather direct feedback on features to keep the process of testing, validating, and iterating. What do pet owners care about? One of my favorite projects I worked on as a design at Whistle was keeping GPS functionalities in mind to create a better user experience for people to find their pets if and when they leave a designated safe place. As the core feature of the Whistle products, we have taken this feature through multiple iterations these past few years, finally arriving at the adaptation of the Google maps API which empowered us to take the Whistle GPS experience to the next level. I have been the lead designer of this feature for the last year, working with hardware, firmware, and software engineers. By working closely with all facets of Whistle's engineering team and product development process, I've learned so much about what makes hardware products tick, how to translate data on the server side into a more user friendly experience, and how to adapt to technologies like WiFi and Bluetooth Low Energy to further improve the accuracy of GPS features. Below are just a few snapshots of my work on Whistle's GPS location feature. During Beta and qualitative research conducted with early Whistle users, our customers told us they want more details around their pet's activity. 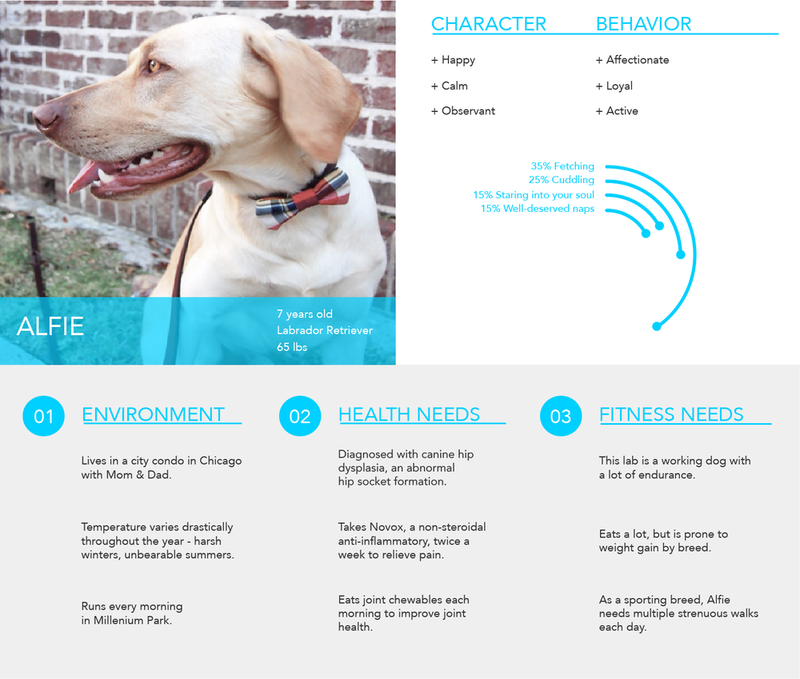 I helped to facilitate a Google Ventures - inspired design sprint, where we re-visited the Activity feature, incorporating user feedback and cultivated a vision around the future of Whistle's role in helping owners maintain pet activity and health. How can we inspire trust in our activity monitoring feature? How can we tell a story about a pet's day? How can we make the pet owner feel more connected to their pet? Below is the result of this design sprint, which is currently what Whistle customers use to keep track of their pet's activity.